As expected Mexican drug lord Joaquin “El Chapo” Guzmán was found guilty on Tuesday of crimes spanning more than a quarter of a century, NBC News reports. A federal jury in New York convicted El Chapo, 61, on all 10 count after a trial that lasted almost three months. After a nearly three-monthlong trial and six days of deliberations, a New York jury found the alleged Sinaloa cartel leader guilty of all counts he was tried on. Posted: February 12th, 2019 under News Story. 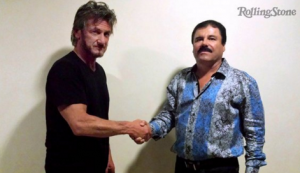 Sean Penn and “El Chapo,” via Twitter. Jack Riley, the former number 2 guy at the DEA, has never been one to mince words. In this case, he’s got some strong ones for actor Sean Penn. He thinks the actor should be behind bars for interfering in the apprehension of the drug lord Joaquin “El Chapo” Guzman. On Oct. 2, 2015, Mexican marines were finally closing in on the drug lord. They had tracked him to a rugged hilltop compound in La Tuna. Just as the order was about to be given to move in, two people inexplicably arrived: Sean Penn and Kate del Castillo, a Mexican soap opera actress who had praised Chapo online. The two were there ostensibly to speak to Guzman about making a film of his life, but Penn later published an infamously softball interview with the kingpin in Rolling Stone. Fearing the actors would be caught in the crossfire, commanders ordered the marines to stand down. The military waited for the celebrities to leave and, instead of going in on foot, chose to attack by helicopter. They lost the element of surprise, and El Chapo escaped again. In 2015, Riley was named ticklethewire.com Fed of the Year. Posted: February 8th, 2019 under News Story. The nasty world of drug lord Joaquin Guzmán Loera, aka “El Chapo,” continues to surface in New York. The latest: Prosecutors in his trial on Friday night, just before jury deliberations are to begin, unsealed secret documents revealing accusations that El Chapo routinely raped girls as young as 13 years old, sometimes drugging them by placing “a powdery substance” into their drinks, the New York Times reports. Posted: February 4th, 2019 under News Story. The fate of notorious Mexican drug lord Joaquin “El Chapo” Guzman is now in the hands of a jury. The jury heard 35 days of surreal, outlandish and often gruesome testimony from 56 government witnesses. The seven women and five men on the jury are expected to begin deliberating Monday to determine whether the notorious 61-year-old conspired to murder countless rivals, traffic nearly 450,000 pounds of cocaine and launder millions of dollars. During close arguments Thursday, Guzman’s attorneys told the jury to dismiss the government’s case because it relies on witnesses who “lie, steal, cheat, deal drugs and kill people,” NBC News reports. Prosecutors said the trial provided an “avalanche of evidence” to prove Guzman’s guilt. Guzman stayed quiet during the trial and declined to testify in his own defense. His life is now in the hands of a jury. Posted: February 1st, 2019 under News Story. When the FBI couldn’t crack the Sinaloa cartel’s encrypted messages, agents did the next best thing: They went after the tech guru who built the sophisticated communications system. Cristian Rodriguez began cooperating with the feds in 2011, handing them the encryption key to listen to about 800 calls from members of the most notorious Mexican drug cartel. On Tuesday, prosecutors played excerpts from what they described as incriminating phone calls that were tapped between July 2011 and January 2012. Jurors heard the calls during the trial of Joaquin “El Chapo” Guzman, the alleged Sinaloa kingpin, The New York Times reports. The elusive El Chapo was captured by a recording device between 100 and 200 times. In many of the calls, Guzman could be heard orchestrating cocaine sales and speaking to corrupt cops. Posted: January 9th, 2019 under News Story. A former DEA special agent is writing a book about his role in helping capture Mexican drug kingpin El Chapo. 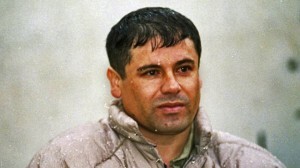 The book, called “Hunting El Chapo,” is expected to be released on Oct. 17. 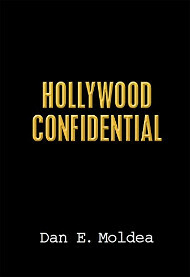 The book will provide a “cinematically” detailed perspective on the investigation and capture of Joaquin Archivaldo Guzman-Loera in 2014. Posted: February 2nd, 2017 under News Story. Notorious Drug Lord ‘El Chapo’ Guzman Extradited to U.S. Notorious Mexican drug lord Joaquin “El Chapo” Guzman, who escaped prison two times in the past, likely will spend the rest of his life behind bars in the U.S. The Justice Department said Thursday that Guzman has been extradited to the U.S., Reuters reports. Guzman is “en route to the United States to face criminal charges in connection with his leadership of the Mexican organized crime syndicate known as the ‘Sinaloa Cartel,'” the Justice Department said in a statement. Posted: January 20th, 2017 under News Story. The son of jailed Mexican drug lord Joaquin “El Chapo” Guzman, was among six men kidnapped by seven armed men who stormed into trendy restaurant in the Mexican resort Puerto Vallarta. CNN reports that the Jesus Alfredo Guzman, 29, was kidnapped shortly after 1 a.m. Monday. Jesus Alfredo Guzman is believed to be involved with the Sinaloa Cartel. At least three of the others who were kidnapped are said to have ties with organized crime. Almaguer said no one reported the men missing, and authorities have not heard from the kidnappers. Posted: August 18th, 2016 under News Story.